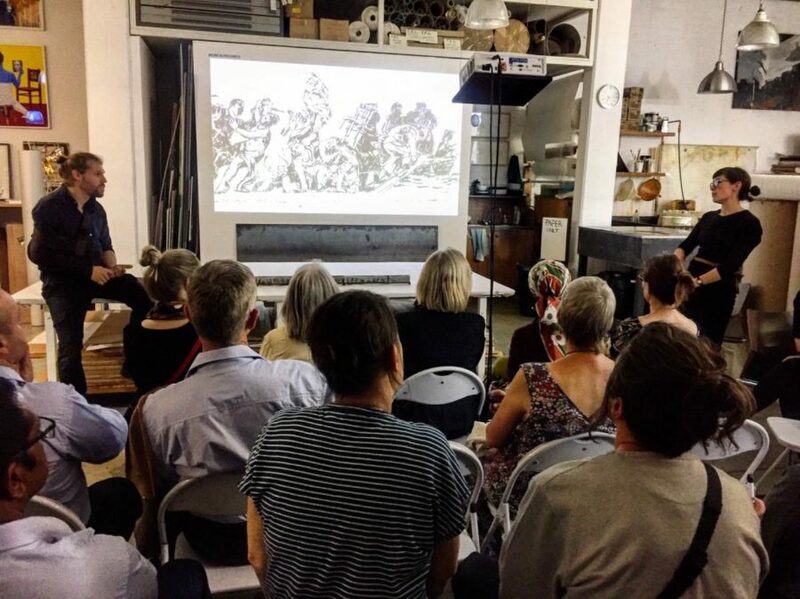 On Tuesday evening, 12 March, the David Krut Workshop invited Chris-Waldo de Wet, the technical director of William Kentridge’s sculpture studio, to come in to talk about the behind-the-scenes process of how Kentridge’s Triumphs and Laments frieze came to be along the side of the Tiber River in Rome. Armed with photographs, videos, maquettes and more, Chris answered technical questions and showcased the intricacies of such enormous projects. DKW’s questions for Chris related parts of the conversation to the series of giant woodcuts currently in progress based on this monumental frieze. On hand were the current state of our last woodcut of the series, Leaning on Air, which in 2-parts spans over 3.5 meters.